Have you ever had something really stinky in your house but you didn’t know the source? Several days ago, I noticed something smelling kind of, um, swampy in the kitchen. I figured it was the trash, even though the smell was most intense a few feet away, rather than right next to it. I continued smelling something over the next few days, but the trash had long since been taken out, so I thought, what’s the deal??? I looked all over in the area from which the smell seemed to emanate, but I still didn’t see anything that could be the source. Yet the smell intensified. I was so perplexed, I must admit that the possibility of it being the stench of a disembodied spirit kind of flickered through my mind. I mean, what else could get that funky without showing itself? Finally, it dawned on me what the smell was: Some old flowers. 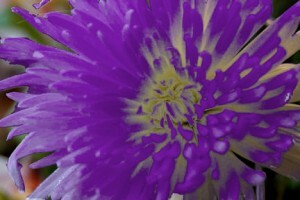 Several weeks ago, my husband got me some beautiful purple mums, which last for a long time. But obviously they don’t last forever, and when they go bad, oh, boy, do they ever go bad. Lesson learned: Chrysanthemums make a fantastic cut flower, but change their water often, avoid pinched vases (poor air circulation), and for the love of all that is good and non-stinky, don’t put them somewhere that you might forget about them!